The garden continues to give its bounty. Today I thinned out the parsley and the newest crop of radishes. 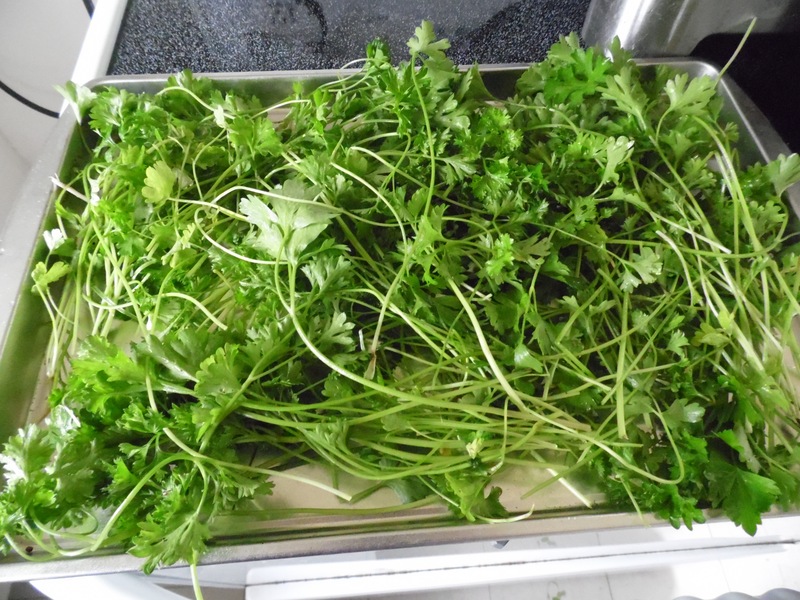 Even after setting some aside for salads and drying I still had far more parsley than I could use. I found Bobby Flay’s Food network recipe for mint parsley sauce. I picked that recipe because we were having lamb kabobs for dinner and my flower bed is full of lovely fresh mint as well. It was easy to make. mint, parsley, garlic, mustard, honey and a bit of chile pepper. 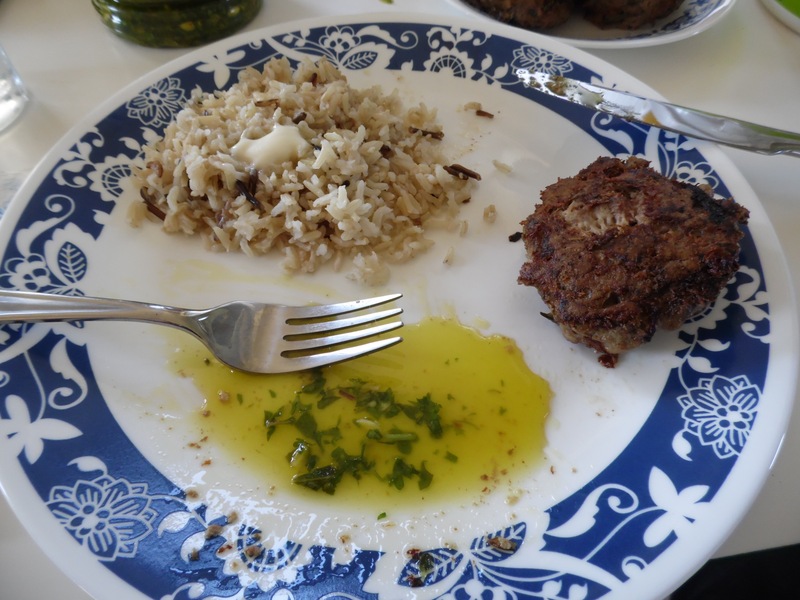 And the result was a heavenly sauce for lamb kabobs I can highly recommend as well as a whole lot of my garden mint and parsley put to very good use instead of being wasted. I figure the garden passed the break even mark last week. As usual, it paid for the amount I spent on seed and rototilling and plants just in the abundant lovely green salads we have been enjoying. So everything the garden produced this week is bonus free food. In addition to today’s mint-parsely we also ate zucchini, onions, spinach, radishes, baby carrots, and some small yellow tomatoes. We will very shortly be eating green beans. Yum! 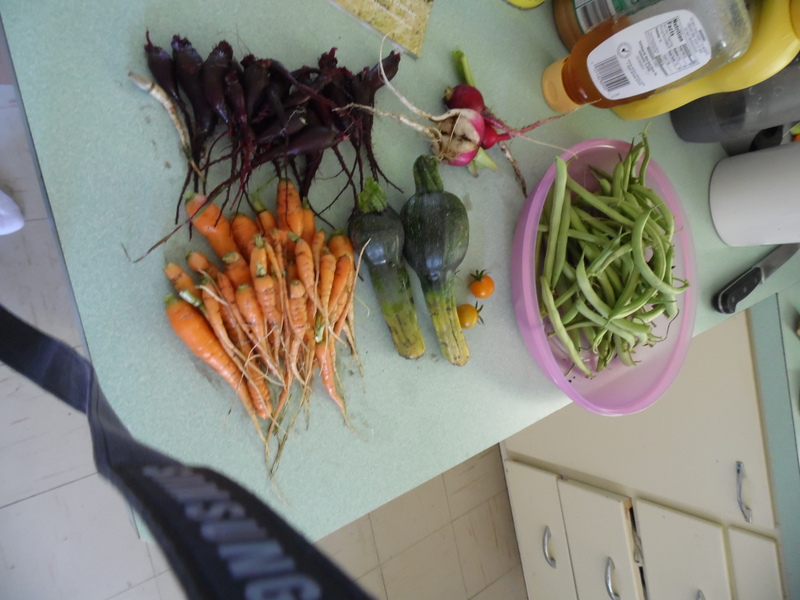 This entry was posted in Food preservation, Frugal living, gardening and tagged Alonsa, Frugal Living on July 17, 2015 by tumbleweedstumbling. Humidex values approaching 40(104F) this weekend. A southerly flow of hot and humid air has developed over much of Southern Manitoba, which is expected to persist throughout the weekend. Daytime high temperatures near 30(86F) will combine with high humidity to create humidex values approaching 40. The heat and humidity will not subside much at night with temperatures only dropping into the high teens. While extreme heat can put everyone at risk from heat illnesses, health risks are greatest for older adults, infants and young children, homeless people, people with chronic illnesses such as breathing difficulties or heart conditions, and people who work outdoors. Drink plenty of liquids especially water before you feel thirsty to decrease your risk of dehydration. I realize that you southerners are probably laughing yourself silly over Canadian weather alerts for a mere 86F. Just remember this next time we laugh at your for not being able to drive in snow. Be that as it may, I hate heat. Heat is the main reason I migrate north for the summer. If not for heat I would probably take advantage of Hubby Dearest’s American citizenship and try for a green card. I haven’t been posting much because I have been busy puttering in the yard and having visiting grandchildren and celebrating Canada Day. The garden is flourishing. Latest update is I have bean and cucumber blossoms and I ate my first home ground zucchini yesterday morning. When I say the blessing on food I add the blessing on good news if its the first time I get to eat something I grew myself and I have been saying a lot of that lately and it’s really nice. The plants are now big enough that the work has slowed down. They are holding their own against any weeds I missed during multiple early rounds of weeding and it’s rained enough I haven’t had to do much watering. I have begun planning for next year as well. Next year I will have two raised garden beds. The old fashioned style row gardening I did this year because it was a cheap way to start out in the new yard is far less efficient and takes a lot more room. There were a bunch of things I did not plant because I didn’t have room in the new garden. Next year, lots more varieties of beans and I’ll add peas. I have a bunch of careful notes I am making about the garden because I simply won’t remember next year when the garden is ready to be planted.The main thing I have noted and underlined and put exclamation marks on is Thou shalt not plant until the full moon in June when gardening above the 50th parallel. No frozen tomatoes next year! I also put in a solar charging station for the house. This is run by solar power from our trailer and we can use it in the house to charge anything rechargeable like our cell phones, my laptop, batteries, and we are running our satellite radio on it. We have to limit ourselves to 600 watts at any given time so the thing is a bit limited. Nonetheless the power is free that way (less our amortized solar installation costs) and we can always do with lower electric bills. We are also beginning the plans for solar in our stick house and how to do the installation in steps that will give us the biggest payoff without breaking the bank. The other really really major thing going on my life is that hubby dearest and I are working on our book “Embryogenesis Explained” which will be published by World Scientific when we are done. It is a book we hope anyone who has been through a basic high school biology can pick and up and read about how embryos are built. The book is finally very close to completion. All chapters are written and we are polishing them and rereading for clarity and consistency. That can be really time consuming, as anyone who knows about scientific writing can attest. This entry was posted in Uncategorized on July 10, 2015 by tumbleweedstumbling.